2mm in diameter, 10 meter length. Genuine cowhide leather beading Cord, Peru Brown Colour tone. Leather is one of the oldest traditional materials used in the production of jewelry. Naturally flexible and extremely durable make leather an ideal cord for necklaces, bracelets and pendants. 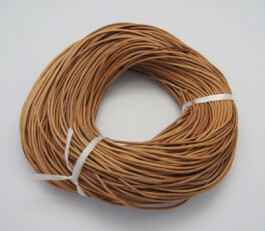 This beading cord is top quality genuine cowhide leather.